The Inkwell » Paul Varner Keeps Publishing Away! Paul Varner Keeps Publishing Away! 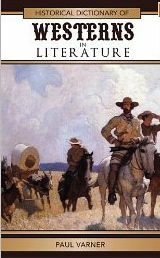 Dr. Paul Varner spent last year seeing his Historical Dictionary of Westerns in Literature (Scarecrow Press, 2010) all the way through the publishing process. Now he’s working on another, the Historical Dictionary of the Literature of the Beat Generation, coming from Scarecrow Press in 2012. He’s teaching a class on the topic this year, too, giving some lucky students a preview of his work on the post-WWII counterculture. I hope he doesn’t mind if the thought makes me want to buy a beret and read some poetry. But then, as soon as he finishes working on the Beat Generation, he’s signed another contract—he’ll be writing on The American West in Film and Literature, a book to be published by Cambridge Scholar’s Press. Thanks for keeping us on our toes, Paul, and for leading the way in scholarship. We’re excited to see your books take shape!